← Do You Sound Your Age? Did you know that Down Syndrome is the most common chromosomal condition, affecting 1 in every 691 babies in the United States? October is Down Syndrome Awareness Month, a campaign designed to raise public awareness of this disorder and increase inclusion within the community. In support of this campaign, this week SANY will discuss some of the speech, language, and communication deficits that often accompany Down Syndrome. Language: Some aspects of language are difficult for people with Down Syndrome, while others are relative strengths. Individuals with Down Syndrome often develop a strong vocabulary, and are particularly good with pragmatic (social) language. Non-verbal communication (e.g. facial expression and gesture) is also usually a strong point for individuals with Down Syndrome. Grammar is one of the more difficult areas. Sentence structure, verb tenses, and word endings are often problematic. 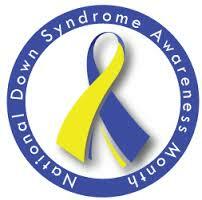 In general, individuals with Down Syndrome have better receptive language than expressive language. This means that they typically understand much more than they can express. Speech: Clear, understandable speech is one of the more difficult areas for people with Down Syndrome. There are a variety of physical factors that can affect speech production, including issues with respiration (breathing) and coordination and strength of the muscles used in speech. Check in with us again next week, when we’ll discuss some of the ways speech-language therapy can help individuals with Down Syndrome communicate. This entry was posted in Down Syndrome and tagged Down Syndrome, language therapy, speech therapy nyc, speech-language pathologist nyc. Bookmark the permalink.